You are here: Home » Featured » Our Lady of All Nations: Approved? Our Lady of All Nations: Approved? The case was examined by the local Ordinary of van Haarlem, Bishop Johannes Huibers, who decided the claims were not supernatural in origin. His decision was affirmed in May, 1974 by the Congregation for the Doctrine of the Faith (CDF) in a Notification. [ii] The Notification ordered the immediate ceasing of all publications on the claims. Efforts to rehabilitate the claims began sometime after the Notification was issued. On May 31, 1996, the above efforts led the new Bishop of van Haarlem, Henricus Bomers, to approve the devotion to Our Lady under the title of “Our Lady of All Nations.” He fell shy, however, of approving the alleged messages attributed to the “apparitions” to Ida Peerdeman. The document approving the devotion but not the alleged messages was undersigned by Bishop Jozef Marianus Punt—then auxiliary of van Haarlem. On July 21, 2001, Bishop Punt succeeded Bomers after the latter’s death in 1998. [iii] Less than a year later on May 31, 2002, Bishop Punt declared the “apparitions” to Ida Peerdeman to be supernatural in origin. A subsequent development, however, questions Bishop Punt’s authority in this matter. Msgr. 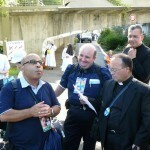 Scicluna (right) at the 22nd Mariological Congress in Lourdes, 2008. 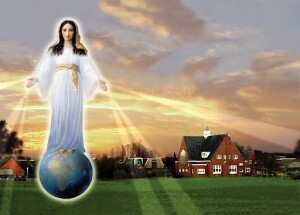 Another case, that still continues to be problematic, would be Amsterdam for the alleged apparitions and revelations of the “Lady of All Nations.” The Servant of God, Paul VI, on 5 April, 1974 approved the decision of the Congregation to publish the negative judgment “Constat de non supernaturalitate” taken 27 March, 1974. The Notification of the Congregation for the Doctrine of the Faith bears the date of 25 May, 1974 and has been newly proposed in “Documents of the Congregation for the Doctrine of the Faith” published in 2006 (Documents 22, p. 90). Scicluna’s point raises some questions: First, if the Congregation for the Doctrine of the Faith issued a negative judgment on the Amsterdam claims, did the local Ordinary, Marianus Punt, have the requisite authority to declare the claims to be supernatural in origin in May, 2002? Given the hierarchical nature of the Congregation’s Notification, one would have expected Punt to say something of this matter in his May 31, 2002 letter but strangely he did not and there is nothing elsewhere in any of the literature about it. Was the case of Our Lady of All Nations approved? It appears as though there are some explanations in order. [iv] Msgr. Charles J. Scicluna, Orientamenti dottrinali e competenze del vescovo diocesano e della Congregazione per la Dottrina della Fede nel discernimento delle apparizioni mariane in “Pontificia Academia Mariana Internationalis”, Apparitiones Beatae Mariae Virginis in Historia, Fide, Teologia. Acta Congressus marioligici-mariani internationalis in Civitate Lourdes Anno 2008 celebrati. Studia in sessionibus plenaria exhibita, vol 1, PAMI, Città del Vaticano 2010, 329-356. A full translation in Spanish can be found on the Archdiocese of Salta’s web site. Citation for the Italian (with a partial citation of the Italian text) can be found here.